I wrote this down for a friend who is planning a trip there. I thought I’d blog about it for everyone else’s benefit. This might be a bit random stream of consciousness as I write this but I hope it helps. You’ll probably be landing at Keflavik which is a bit away from the main centre. The Blue Lagoon (http://www.bluelagoon.com/) is near the Airport so you might want to consider making it one of the first or last things you do if time is a factor. You can book trips to it when you’re there or book tickets online before you go. The next thing to know is that they leave their headlights on all of the time which takes a bit of getting used to. The town itself is very compact and easy to work around. I really liked walking around the lake near the City Hall. The National Museum of Iceland is also very interesting. This might not be your thing but the Icelandic Phallogical Museum is well, dedicated to penises and I enjoyed it as it’s a bit goofy and off the wall. If you like architecture or churches then Hallgrímskirkja is the biggest church in Iceland and I think it’s beautiful. http://www.hallgrimskirkja.is/ and I think you can walk up the tower although this isn’t something I did. I think Damon Albarn still owns it and you’ll know you’re there when you see the London Underground type sign. In general most places were good. If you’re going during the twilight season please be aware that most people won’t be going out until at least 12 or maybe later. If you do go to a club then don’t be surprised if “Nellie the Elephant” is the last song they play. It’s a tradition there apparently. Thingvellir is an national park which shows you those amazing volcanic rock fields as well as the original Icelandic parliament. I think we went on a Golden Circle Tour which covered this in one day. It’s not going to stop, until you Wise Up. Sometimes a song and a movie are intertwined in your memory. I have Magnolia on DVD and watched it once. I do want to watch it again mainly because of the great ensemble performance and a reminder of what a great actor Jason Robards was. The scene that I always remember is the one where the cast sing to “Wise Up” by Aimee Mann. That song is the movie for me and the one I listen to most on the accompanying soundtrack. Learning Node.js, Express, and Jade. I spent most of today trying to come up with a sample site that I would be happy to have live on the Internet. The work in progress is at https://github.com/FinVamp1/NodeGIT and I am happy with what I’ve done today. To set the scene I should explain that in order to demonstrate the GIT Integration that is included in Windows Azure Web Sites I have a dummy Node.js site that I store on GitHub. I can then show the workflow where I edit the site locally in WebMatrix and then commit the changes up to GitHub and then onto Windows Azure Web Sites. Here’s the view of the default route. I knew I wanted to extend this into a proper web site and so I did some reading on the Jade View Engine and decided I wanted to use the layouts and blocks support as discussed in this link. The issue with this approach is that the default site comes with Express 2.5.7 and the Blocks and sections comes up with Express 3. So I decided to upgrade to Express 3. This was relatively pain-free as I just needed to pop out to the command line and run this command. This upgraded both my Express configuration and saved the package changes. Then I should be ready to go, right? Well first I needed to update my version of Node.js on my dev machine to the latest to support Express 3.
and commented out the line with the calls to app.address etc. Then I was ready to go. a(href=”http://blogs.msdn.com/finbar_ryan”, title=”Work Blog”) My Work Blog. a(href=”http://www.finbarrsweb.com”, title=”Personal Blog”) My Personal Blog. a(href=”https://twitter.com/FinVamp1″, title=”My Twitter”) Find me on Twitter. a(href=”https://www.facebook.com/finbar.ryan”, title “My Facebook”) Find me on Facebook. a(href=”http://uk.linkedin.com/pub/finbar-ryan/10/717/b44″, title=”My LinkedIn”) Find me on LinkedIn. Note: You’ll also see that I used include which gives me the flexibility of having a Header and Footer with the content defined in jade files of those names. Nicola Hibbert and her migration blog. The Express Wiki on Migration. I thought I would share how my Media streaming is setup at home. It’s complicated a little by a kind of cross-platform devices but it works for me. Downstairs I have a little Shuttle PC that sits under the TV and records stuff from FreeView. That sits above a Sky HD Box that records all of the HD stuff I like to watch. I also have an XBox setup with NetFlix, BBC iPlayer, 4OD, Channel 5 OnDemand and Lovefilm. The Shuttle PC is running Windows 7 Media Center and has a dual tuner card. This records onto an SSD drive and then archives the recordings off to a HP MediaSmart Home Server. Then in the bedroom upstairs I have a litter Acer Revo Nettop computer that streams the recordings off the Web Server. I also have a little Apple TV device also for Netflix and if there is something on iTunes I would like to watch. Today I decided to have a day out. It’s been a busy couple of weeks at work even with the Christmas breaks in between. I was thinking of going to Oxford today anyway and then my guitar teacher mentioned that there was a Japanese exhibition on at the Ashmolean and so my plan was set in motion. I went straight to Oxford this morning and had breakfast there and then went to the museum. There was another exhibition on about Edward Lear who did “The Owl and the Pussycat” poem so I bought the ticket for both. I did like the nonsense work that Lear did but some of his landscape works were very interesting. 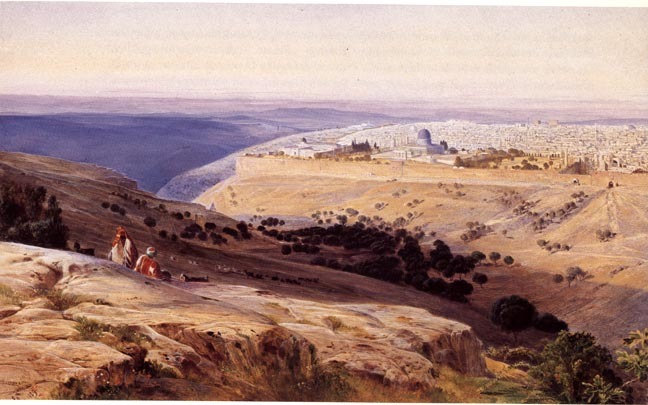 Like this one of Jerusalem. (Linked from http://www.victorianweb.org/painting/lear/paintings/3.html). The textiles exhibition was also very interesting with all of the intricate thread work and attention to detail. I had a nice lunch at Byron ( http://www.byronhamburgers.com/news/the-chilli-burger-is-back/) and then did some shopping. I had heard good things about it and I was hooked from minute one. All of the actors put in a great performance and especially Jake Gyllenhaal who I don’t always enjoy. So I really enjoy the TV show “The Great British Bake-Off” and this year have been tempted to give it a go myself. Last weekend I bought the Paul Hollywood book “How to Bake” but before I delved into this I decided to try an Irish family favourite. 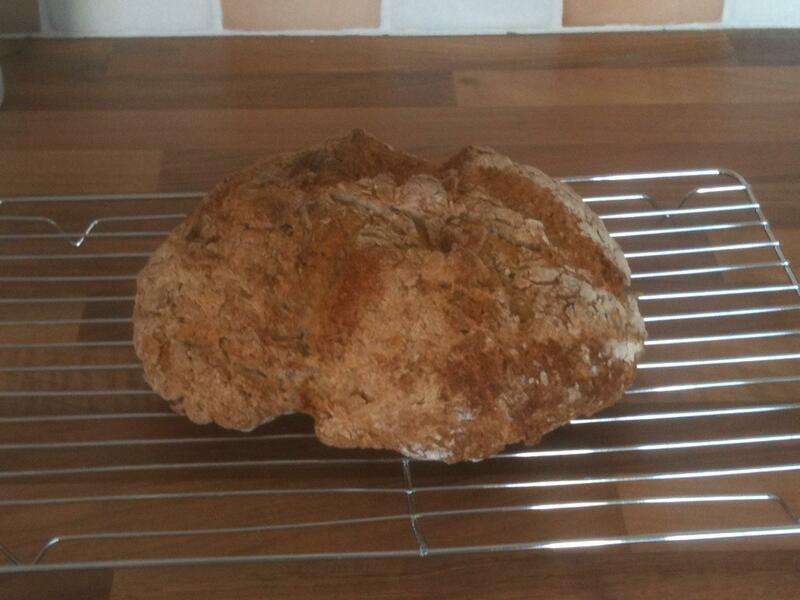 So I followed Darina Allen’s recipe from the “Ballymaloe Cookery Course” book. 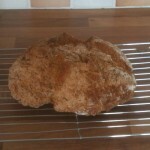 And here is the end result and it tastes very nice if I do say so myself! So currently I am watching Season 4 of Being Human and I am enjoying it. Without giving too much away I was concerned that some cast changes might not be the same as the previous three series with the amazing cast of Mitchell, George and Annie. However the new characters are fitting in very well and it helps that Tom was introduced in previous episodes. The humour is still there which some people don’t like but I do. It’s not like Twilight where everything is so serious and I think the levity helps underscore the more serious aspects of the story. Just finished reading “The Little Stranger” by Sarah Waters. I should probably start by saying that I absolutely loved The Night Watch by the same author. So all of the things I loved about the “The Night Watch” are also present here in this book. This is a story of a Doctor in Gloucestershire who starts to work with a family who live in an old manor house and how they start to become closer and then strange things start to happen. I’ve not read a lot of books about the time in which the book is set. It’s post World War Two and rationing is still in effect and one of the lead characters was involved in the war. It’s the little touches I like about how did you maintain an estate in those days? How did a bachelor doctor live and work and what were their thoughts about the soon to be established National Health Service? Ms. Waters answered these questions and you are quite quickly drawn into the world of this book and of it’s characters and that is the main appeal of the book for me. I won’t talk too much about the ghost story aspect of it but it was also done very well and rang true. Here are some other links to reviews of this book. It seems that I’ve not been paying attention to this blog and it’s been over 2 years since my last entry. I like to write little bits and pieces and wil try to keep this updated a bit more frequently. and then travelled down to my brothers house for a couple of days. Then I went up to Dublin and stayed with my friend Paddy. It was nice to see him and we went out for a nice dinner with another friend Donal and some Italian visitors who were visiting Dublin for a couple of days. I was wearing my “I am the Empire” T-Shirt from www.microspotting.com and this was very popular. I also visited my cousin Aine as I hadn’t seen her for a while and it was nice to catch up. Then I came back home for 4 days and returned to Dublin for the U2 Concert on Saturday the 25th of June 2009. Myself, Paddy, my sister Anne-Marie and her husband Dave went and my brother was also there but in a different part of Croke Park. We had a brilliant time and I was on my feet dancing around for 2 hours straight. I travelled home on the Sunday and since then it’s been work, gym and sleep. Books that I’ve read recently. Here’s a list of some of the books I’ve read recently and some little capsule reviews. This is a great book. I love Murakami because his characters are so interesting. They go through their daily lives and something happens and they integrate into their lives and then continue. It’s a very sad book because so much happens to the characters but also very life affirming. I really liked “Disgrace” by the same author and I liked this one too. It’s strange because I don’t know if I quite understand what was happening in the latter two thirds of the book but I know I liked that it happened. It was paced very well. I picked this one up because I was interested in the central idea. Sigmund Freud makes his first and only visit to New York and is involved in resolving a murder and an attack on another heiress. The involvement of Freud was secondary to the main character Stratham Younger but it was a good read. I didn’t anticipate the ending and so it’s worth a read for that alone. Another book purchased on the back of the concept. A Presbyterian minister in Scotland meets the devil. It wasn’t what I expected and was less about the devil and more about the man Gideon Mack. It was bookended by an a prologue and an epilogue that presented this as a real story and in many ways it was. I would have liked to have met Gideon Mack and discussed his story. This book is set in Madrid in 1940 after the Spanish Civil War. I have to admit that it’s a time in history that I’m not that familiar with it. I do want to know more about it though. It was an interesting portrait of a different time and an Englishman who is placed into this world as a reluctant spy. This collection of Short Stories was lent to me by my friend Brian and it was a delight. I read a lot of sci-fi when I was a teenager and this book reminded a lot of those times. The world that he created was very different from the worlds like Dune created by Frank Herbert and PhazeProton created by Piers Antony. Some of the stories were very long and exceeded my bus journey times while some others were short. I liked the idea that in a world where men had very long lifespans they had forgotten a lot of the trials and tribulations that make us human in the first place. I also discovered that the song “Starlight” By Muse fits the story “The Lady who sailed The Soul ” very well. © 2019 Finbar's Blog.. All rights reserved.